Botswana is a land-locked country in the heart of southern Africa (click here for map). Its 581,730 km2 are thinly populated by about 2 million people, mostly concentrated along the eastern and northern margins of the Kalahari desert, a flat, sand-filled basin averaging 1,100 meters above sea level. The eastern part of the country rises slightly towards the neighboring countries of South Africa and Zimbabwe. Exposures of Archean Kalahari Craton basement, the Limpopo Belt and the Zimbabwe Craton can be found in hills and dry river valleys. The northern part of Botswana is dominated by the Makgadikgadi salt pans. The pans are the remains of an enormous inland sea that dried up several thousand years ago after earthquakes caused the Zambezi River to change its course towards the Indian Ocean. In the Northwest of Botswana, the Okavango River supplies water to the Okavango Delta, which is one of the largest inland deltas in the world. The Okavango Delta is a UNESCO World Heritage Site and one of the Seven Natural Wonders of Africa. The age of magmatic and metamorphic basement rocks decreases from the east and the northwest towards the so-called Botswana Rift to ~1.1 Ga. Minor amounts of Archean and Proterozoic sediments occur in the east, but the majority of the sedimentary and flood basalt cover belongs to the Karoo Supergroup (Carboniferous to Jurassic in age), followed by conglomerates, shales, sandstones, loose sand and calcrete of the Kalahari beds (Cretaceous to recent). Most of Botswana’s kimberlites were emplaced post-Karoo, but are typically covered by several tens of meters of Kalahari beds, the main reason for their relatively late discovery. Thousands of years ago the area was inhabited by the San (called “bushmen” by the Europeans and “Basarwa” by the current majority, the Tswana), who authored most of the rock paintings found in various places, most importantly the Tsodilo Hills in NW Botswana. Bantu-speaking farmers, the Khoikhoi, appeared partway through the first millennia. Both ethnic groups have diminished to small numbers today and the dominant ethnic group of tribes that established itself over the past centuries in the area are the Tswana (calling themselves Batswana as a group and Motswana as individuals). Encroached by Ndelbele tribes from the north, Boers on their northwestward expansion and in particular threatened by the expansion plans of Cecil Rhodes who intended to make Betchuanaland part of the then Cape Colony (which later became South Africa), the paramount chiefs of the three most important Tswana tribes (Khama III; Bathoen and Sebele) made a legendary journey to Queen Victoria of England to ask protection from her, which was granted on 31 March 1885. 81 years later, on 30 September 1966, the Betchuanaland Protectorate was released into independence and renamed Botswana after the first democratic elections in 1965 had shaped the political landscape and the Botswana Democratic Party (BDP) led by Seretse Khama (later Sir Seretse Khama) had emerged as the strongest political force. After Seretse Khama’s death, two politicians of the founding generation followed in office as President: Quett Masire and Festus Mogae, the latter turning over office to Ian Khama, son of Seretse Khama (and like him paramount chief of the main Batswana tribe, the Bamangwato), who is currently serving his second term of office and continuing the tradition of a stable representative democracy with a consistent record of uninterrupted democratic elections. Since independence 1966, Botswana has transformed itself from one of the poorest countries in the world to a middle-income country. The mineral industry provides about 40% of all government revenues. Several international mining corporations have established regional headquarters in Botswana, and prospected for diamonds, gold, uranium, copper, nickel, iron and even oil and coal bed methane. Government announced in early 2009 that they would try to shift their economic dependence on diamonds, over serious concern that diamond production was predicted to decline in Botswana over the next twenty years, and have followed a course of economic diversification. Cattle farming and the tourism industry are the two other major contributors to Botswana’s economy. The summer season in Botswana is from November to March. As this is also the rainy season, the hot temperatures of up to 40°C are moderated by occasional rainfalls for a short while. Winter season from May to August is dry and usually the preferred time for field work, but the evenings and nights can get quite cold with temperatures down to below 0°C. The in-between periods of April-early May and September-October are also dry, with clear skies, no strong winds and pleasant day and night temperatures. September temperatures in Gaborone and the Botswana field trip areas range between lows of 10°C and highs of 28°C. Rainfall and average temperatures generally increase towards the north and northeast. 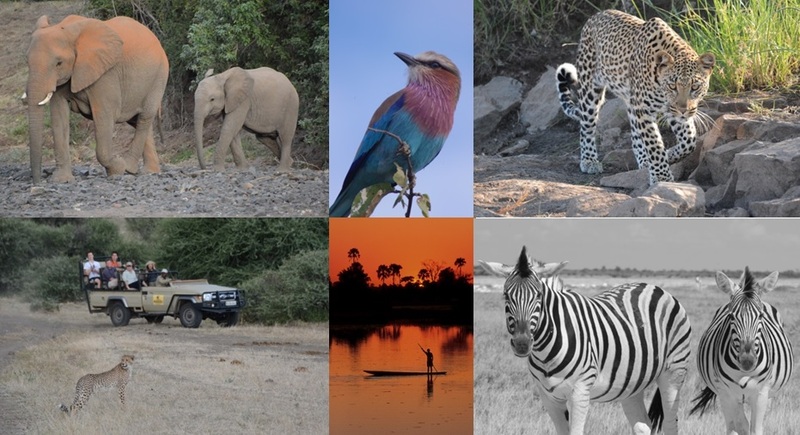 Almost 40% of the land in Botswana is dedicated for nature reserves, sanctuaries or wildlife management – more than in any other country in the world and is well-known for its quality of safari. The website of Botswana Tourism provides detailed information about these protected areas and many other aspects of Botswana.